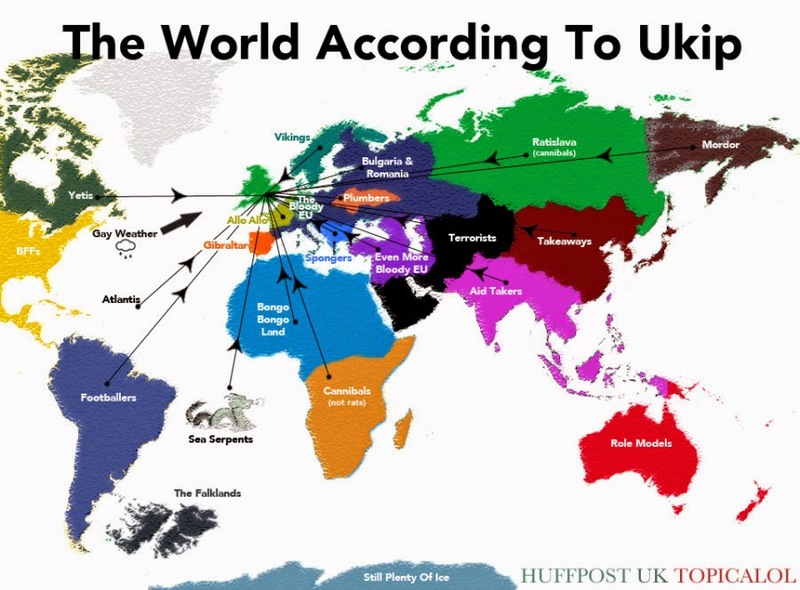 This chart shows the World According To Ukip. The UK Independence Party (UKIP) is a Eurosceptic and right-wing populist political party in the United Kingdom. Headquartered in Newton Abbot, Devon, its leader is Nigel Farage. UKIP has one Member of Parliament in the House of Commons, three representatives in the House of Lords, and twenty-two Members of the European Parliament, making it the largest UK party in the European Parliament. It has 497 councillors in UK local government and one member of the Northern Ireland Assembly. UKIP was founded in 1991 by the historian Alan Sked as the Anti-Federalist League, a single-issue Eurosceptic party. Renamed UKIP in 1993, the party adopted a wider right-wing platform and gradually increased its support. The World According To UKip, http://2.bp.blogspot.com, viewed 14th March, 2016, <http://2.bp.blogspot.com/-V6wZ-_BPxcE/U3PK8H0rNOI/AAAAAAAABTc/cLy99-FblT8/s1600/o-ukip-world-map-900.jpg>. The World According to Ukip, ChartsBin.com, viewed 26th April, 2019, <http://chartsbin.com/view/39658>.